I can remember going to see Scream when it first premiered and being so nervous. Horror movies are rated not for me, but everyone I knew was talking about Scream and I didn’t want to be the wimp who wouldn’t go. Of course, I was pleasantly surprised, as it turns out that Kevin Williamson makes horror I can tolerate—the kind where he upends tropes, adds a dash of humor, and doesn’t wallow in unnecessary gore. In his new series Tell Me a Story, Williamson mines fairy tales for fodder. And, let’s be honest, with wolves dressed up like grandmothers and the fixation on dead parents, it’s not like fairy tales were a laugh riot to begin with. Here, Williamson weaves stories loosely inspired by The Three Little Pigs, Hansel and Gretel and Little Red Riding Hood to tell a story of the horror of living in the modern era. As Williamson well knows, the world is scary enough. With the horrendous events of the past week, we don’t need a TV show to tell us what an awful place it can be. Beth (Spencer Grammer) worries about bringing a baby into the world filled with such violence. “I don’t think there will ever be a time for children,” she tells her fiancé, Jordan (James Wolk). In the pilot, Jordan and Beth are the most compelling. And they firmly set the story in Trump’s America. “Can we please not ruin another dinner by talking about Trump?” Jordan asks. For others, the series has yet to reveal the way it will pay full homage to the stories that inspired it. Hannah (Dania Ramirez) is struggling to forget her past, while Eddie (Paul Wesley) and his brother, Mitch (Michael Raymond-James), are finding less than respectable ways to make money. When Hannah’s brother, Gabe (Davi Santos), gets into trouble, he calls her because he doesn’t know what to do. “Leave me out of it! You could have left me out of it!” Hannah screams. The cast is for TV fans. 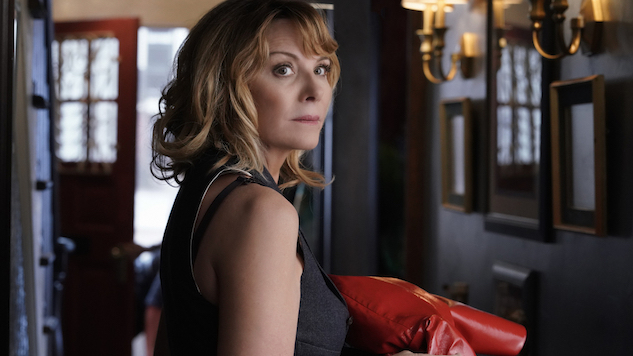 In addition to Cattrall, the series pulls mainstays from The Vampire Diaries, Parenthood and Once Upon a Time. While watching, you can play a fun game of “Where have I seen them before?” Oh look, there’s the dad from Netflix’s One Day at a Time. Since it drove me crazy while watching, I’ll save you the trouble and tell you Magnussen was Kato Kaelin in The People v. O.J. Simpson: American Crime Story. CBS All Access plans to release a new episode each Thursday, with a total of ten episodes. The first two hours are compelling, setting up multiple stories worth telling—and worth following. (Plus, there are two shower scenes with Wolk, who I’ve long thought should be a TV star.) What’s challenging is that, with only two episodes to go by it’s hard to determine if the show will thrive, stay the course, or collapse under its innovative premise. Tell Me a Story is the sixth original series being offered by CBS All Access. While it’s a strong drama so far, it still isn’t enough to make it necessary to subscribe to the streaming platform, which for CBS All Access might be the scariest thing this Halloween. Tell Me a Story premieres Wednesday, Oct. 31 on CBS All Access. Subsequent episodes will premiere Thursdays. Amy Amatangelo, the TV Gal®, is a Boston-based freelance writer, a member of the Television Critics Association and the Assistant TV Editor for Paste. She wasn’t allowed to watch much TV as a child and now her parents have to live with this as her career. You can follow her on Twitter (@AmyTVGal) or her blog .